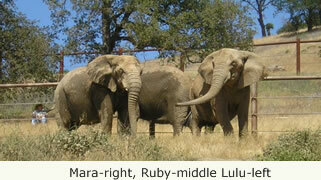 After almost two years, Lulu continues to thrive and develop her place in the African elephant hierarchy at PAWS. Physically, she is in very good health, eating well and developing muscle tone from climbing steep hills, digging in the rocks and pushing over trees. She is very cooperative with foot care and enjoys training sessions at the PC wall. She is comfortable with all of her keepers and baths, shifting and foot trims are part of her daily routine before going out to the habitat. She is incredibly intelligent and enjoys the morning routine. Psychologically, we have observed many important changes in Lulu's attitude toward the other elephants. When she first arrived, our greatest challenge was alleviating her fear of 71 and Mara and her anxiety when she felt trapped inside any area. When we released her into the big habitat, she stayed outside all night (it was quite warm outside, so that was not a problem) and hesitated at the gate on coming back in. Realizing these fears were deep seated, we concentrated on moving her slowly through gates and into different areas, giving her ample time and space to comfortably chose to move through a gate and allow it to close behind her. Lulu has the long hallway in the middle of the inside stalls which enables her to approach 71 and Mara whenever she chooses and to retreat at will. This has become an excellent tool for her socialization with the other elephants, and she is now totally bonded with both of them. She no longer squats when they approach, she faces them first, then slowly turns her back to them displaying traditional elephant behavior, and spends a lot of time trunk touching and vocalizing with them. We have been very cautious with this process because of her past history with an overly dominant female and our desire to allow her to socialize without stress. I believe this was a good decision, and we are excited to have some of you see her and the changes in her behavior. When Lulu first arrived, she had a habit of covering herself with feces and throwing feces inside her barn and at her keepers; happily, she seldom engages in this behavior now and she is much calmer with people. We are quite pleased with Lulu's adaptation to her new home and mends; she is a truly remarkable elephant and loved by both elephants and humans at PAWS. We constantly remind all who are interested in elephants and their welfare of the complexity of their society and the challenges which are created by captivity. All moves are stressful to elephants who have an inherent need for functioning social order and close companions, and change is seldom easy. Lulu has begun a long journey which we hope will provide a happy and healthy life. This summer, we will be installing additional elephant cams in the African habitat which will allow Lulu's many mends to watch her. We have also completed a new television series about PAWS which will give viewers an insight into Lulu's socialization as well.